And when you put them together, they explode in your mouth in a burst of tart and sour goodness. 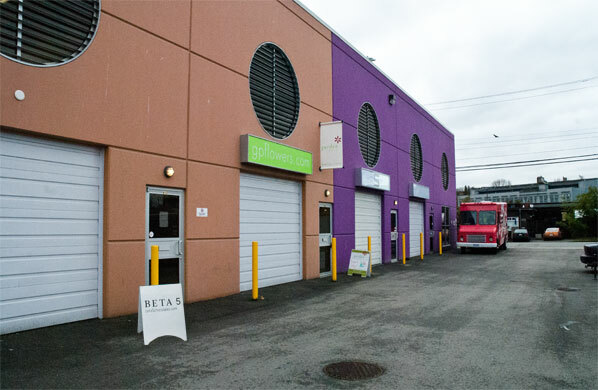 A few weeks ago, while researching (I love doing research for this blog) local chocolatier’s offerings for the Valentine’s Day post, my partner and I stumbled upon Beta 5 chocolates, in the industrial area of East Vancouver. 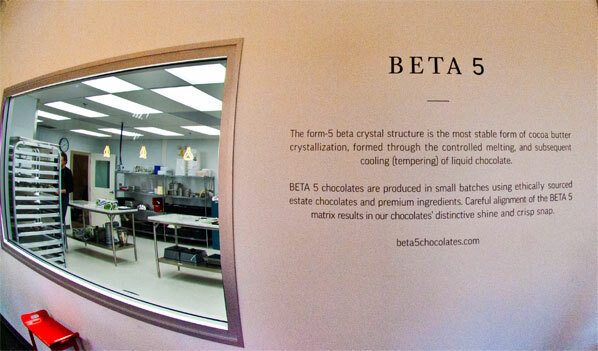 The brainchild of Adam Chandler and Jessica Rosinski, Beta 5 Chocolates takes its name from the stable crystals which form when chocolate is properly tempered, to create the smooth, glossy, snappy look and feel characteristic to fine chocolate. 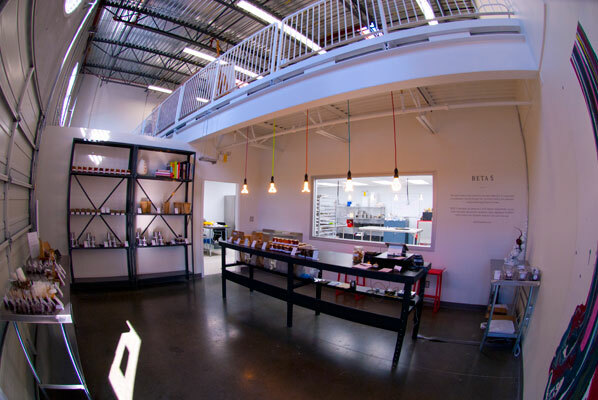 We wanted to create a different kind of chocolate shop. One that uses the best ingredients we can find, in support of farmers and in the name of taste. by committing to making ethical choices instead of profit-driven ones. 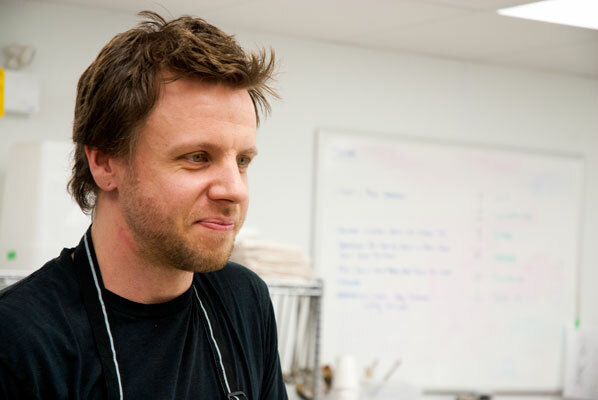 One that is off the beaten path, that blurs the lines between customer and cook. One that revolves around innovation and craftsmanship. Well, I know they make a darned fine candied citrus. 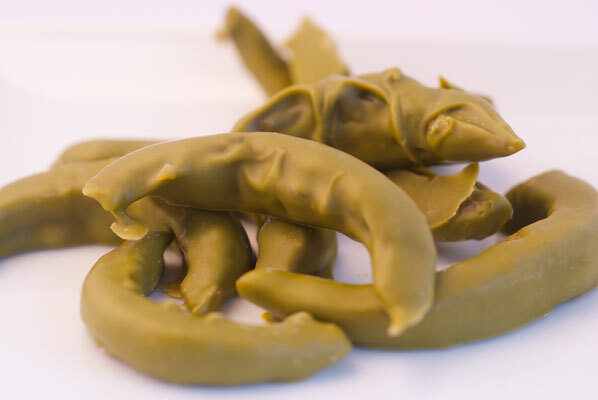 The yuzu zest, of which I waxed poetic at the top of the posting, is enrobed in a matcha white chocolate that is not only absolutely and tartly delicious, but reminds me of Dr. Suess’ Green Eggs and Ham, in its brilliant green-ness, and comical curlicue shape. 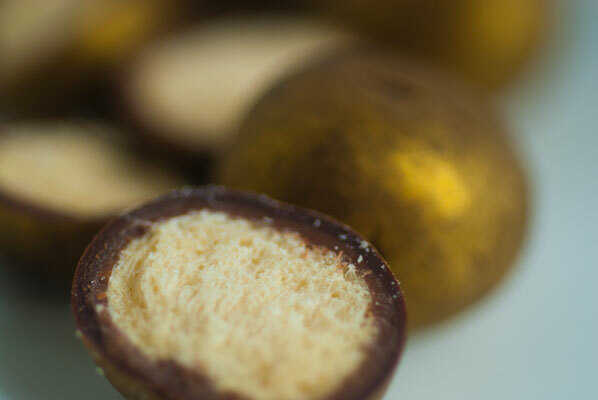 An elegant treat with a sense of humour, packed in a little brown box. I need to find out more about this enterprise. Adam and Jess are gracious enough to allow us to come and talk to them at their shop, which has been operating for almost a year, since March of 2011. 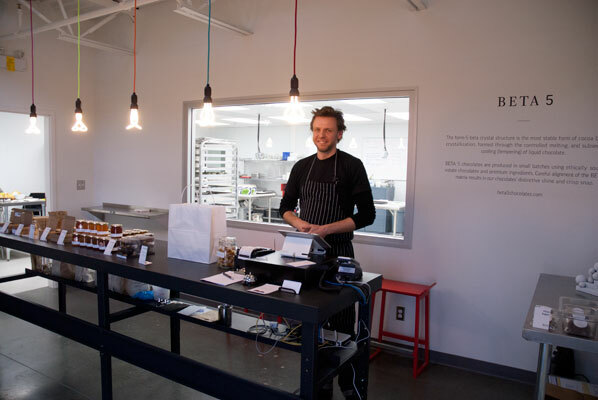 We talked to Adam in the bright, high ceilinged kitchen at Beta 5, whose big windows and open doorways between kitchen and store front, allow customers to watch the chocolate making process, and allow the staff to see who is coming and going, which fits in perfectly with the philosophy of “blurring the lines between customer and cook”. 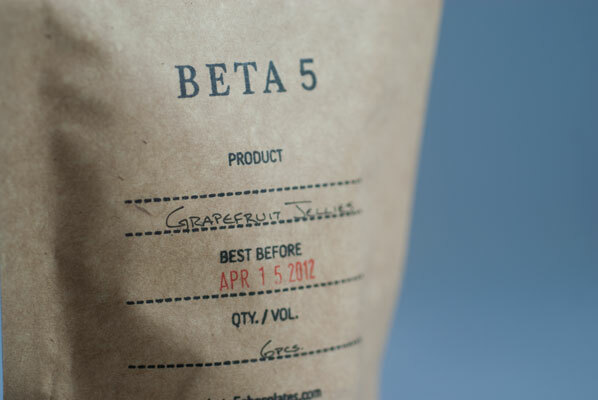 The feel of Beta 5 is definitely in keeping with the industrial nature of the neighbourhood, and their packaging reflects that, as well. The afore-mentioned little brown sturdy corrugated cardboard boxes, sport a base layer of nubbly chocolate, instead of tissue paper, on which the packed chocolates sit. The pate de fruits are packed in brown “mailer” envelopes, and the tumbled fruits and nuts are in mini paint cans. The “brown paper packages” feel continues with their signature chocolate bar. 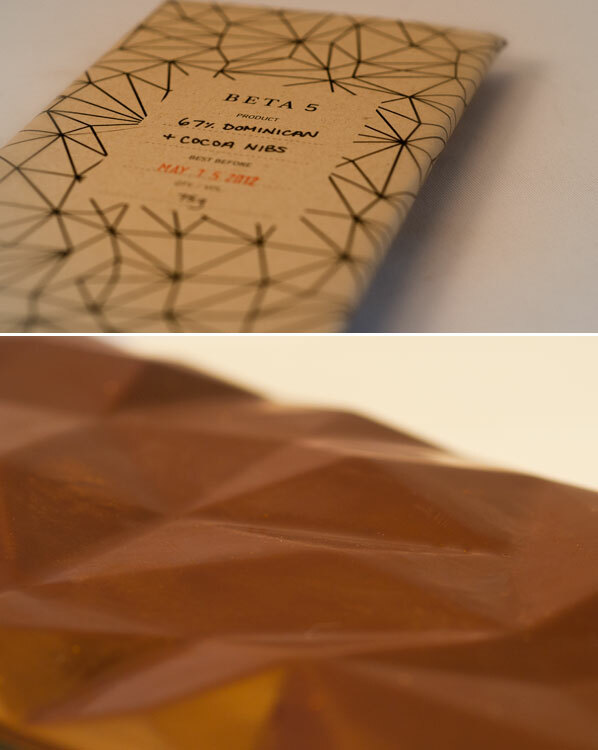 An industrial design friend created the bar’s mountain shape, and the wrapper is the line drawing of the model. Pretty cool. Operating for almost a year now, it was important to Adam and Jess to have their business close to home, in the neighbourhood in which they live. “It’s a short commute” Adam laughs. 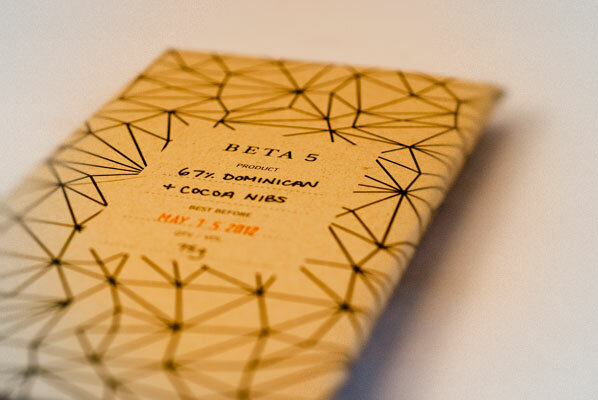 Chocolate is the main ingredient, of course, and a great deal of thought has been put into Beta 5’s choice. 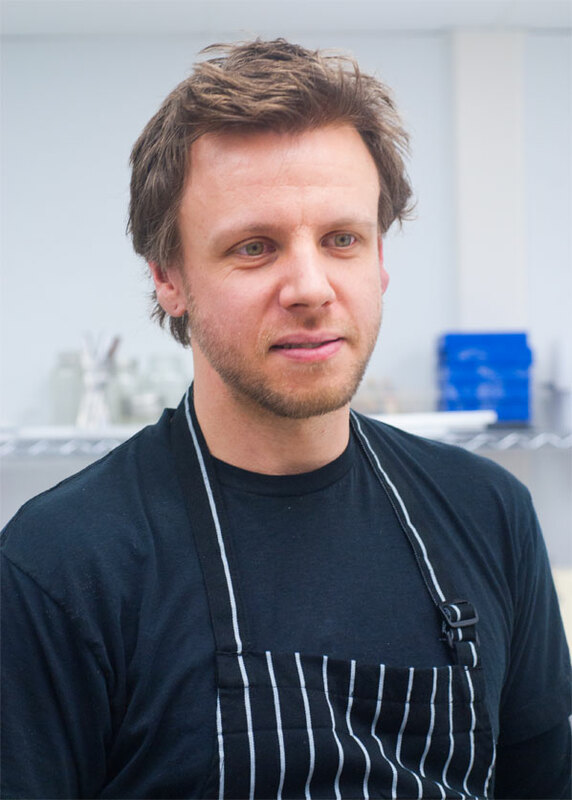 They use Michel Cluizel chocolate, from traceable plantations. 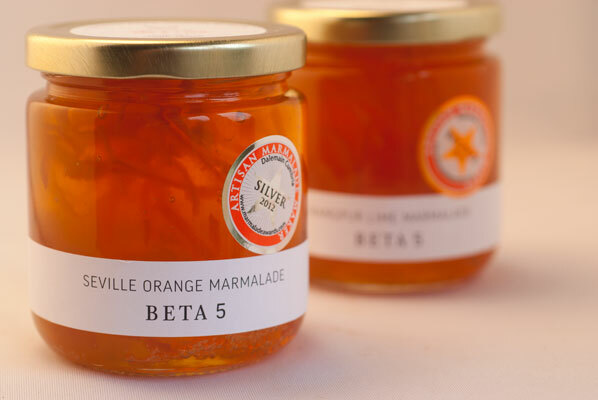 Doing things in small changeable batches, allows Adam and Beta 5 to take advantage of local produce opportunities. Indeed, the raisins did not last (hmm, very smart, methinks. Makes me want them even more!) but there are always four more flavours of Pebble to be had: caramelized hazelnuts, sun dried cherries, espresso beans, and caramelized almonds. 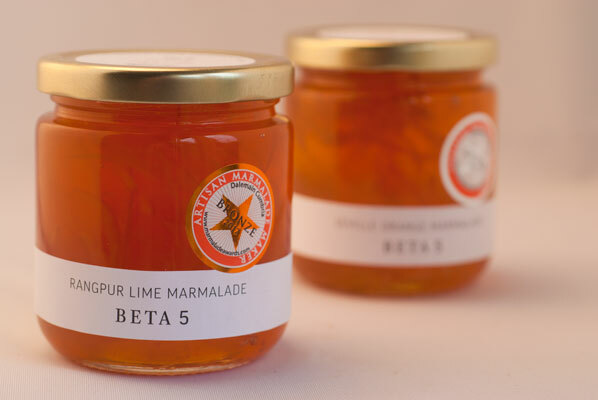 Adam is being just a little modest – their Seville Orange Marmalade just took a silver at the Artisan Marmalade Makers Awards76, and the Rangpur Lime took a bronze. People have also responded to their Pates de Fruits, so they are trying to present a different flavor every month. And he likes giving people a chance to see that in action. 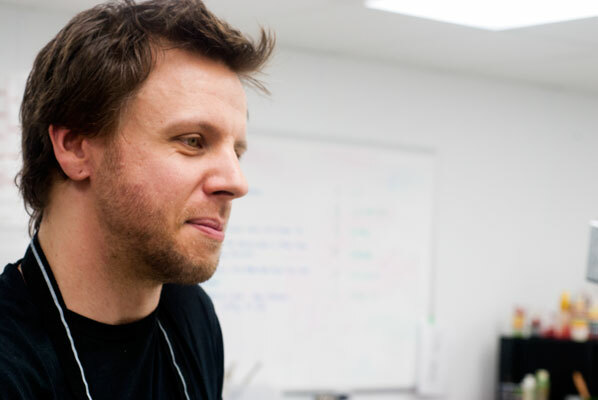 “We wanted to give people the sense of how much work is involved in what we do. That’s the reason for these big windows. We want the people who work for us to have a little room to play, while still having consistency in the product. We want them to have a bit of freedom to explore and make mistakes. That’s how we all get better. Younger son and I used these as a great excuse for an afternoon snack, on this chilly day. 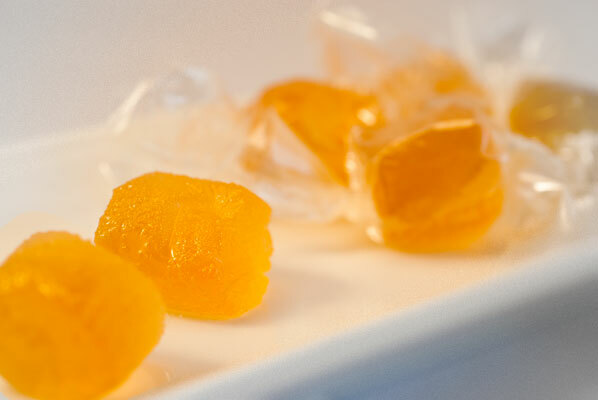 We both agreed that, while both very tasty, and refreshing , with a great balance of fruit to sugar, the Seville Orange had a richer flavor and more distinctive aroma. And perhaps that is due to the type of fruit. I do not think either jar is going to see the end of the next week. Nice texture, but I think I would prefer a sharper citrus taste. These are very mild. Not too sweet, which is nice, just a bit mild. I’d love to see what they do with a zippier fruit. Dark, Rich, winey taste with a tasty crunch of cocoa nibs. Mmmm. 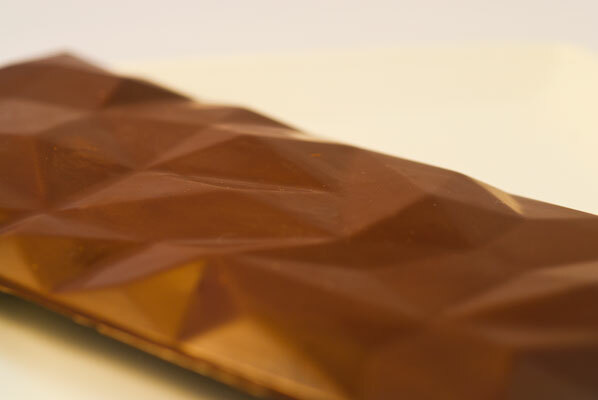 Big thumbs up, and aesthetically, a very pretty, geometric, pyramid textured bar. It’s all about the malt balls. They are gone. My partner and sons have been scrabbling around the base of the shamrock pot, hoping to conjure up more of them. 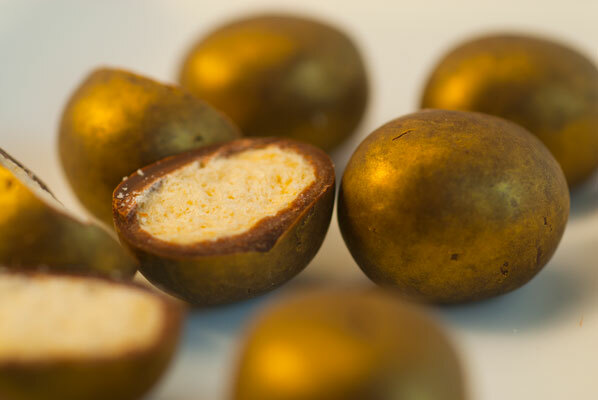 Crispy light texture, which shatters satisfyingly in the mouth, and a creamy shell. Mmmmm. 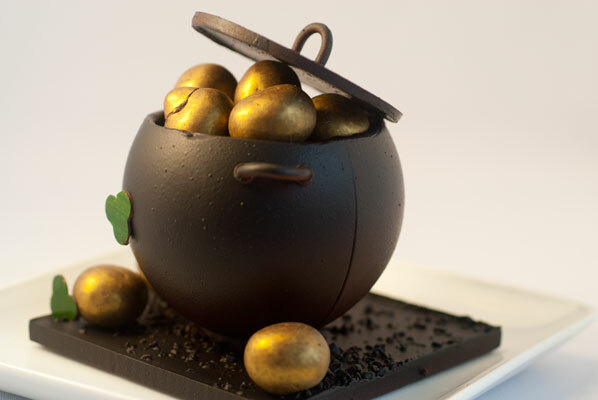 The pot is also a delight to look at, and tastes pretty darn good, too. My absolute favorite. The balance of flavours between the tangy citrus, and the slight bitterness of the match is tempered beautifully by the white chocolate – and I believe even white chocolate haters would love this. I encouraged my white chocolate despising son, who loves citrus, to try one, but then realized the foolishness of my ways – there would be less for me! I would like another box of these tomorrow. Very refreshing, as well as delicious.